Do you want your keywords rank organically on the first page of Google’s search engine? Here are 6 ways you can get multiple organic page 1 ranking on Google. Getting the top plain text organic search result in Google has become more tedious than ever before. Along with search results, the plain blue links are difficult to get as it is becoming rare. Respond to a searcher’s query. A paragraph snippet consisting of approx 50 words, the page title and URL, and a featured thumbnail can provide excellent opportunity to get more visibility on your website. Thus your keywords will have more chances to appear on page 1. Reply to informational questions related to your business and its products and services. Keep your question-answer as a paragraph format and a simple Q&A approach will help you make content that would rank on this type of result. The Top Stories carousel shows the headline, source name, and a lingering image. These blogs can be found through blogs and media websites. If proper optimization is done for the article, then it would automatically get converted into action on the Google Assistant. Google suggests using AMP pages having structured data markup for an improved appearance in the Top stories carousel, Visual stories, host carousel of rich results, and rich results in mobile Search results of rich results. But, it doesn’t mean you can only appear using AMP pages in the Top Stories carousel, rather non-AMP article pages can also be used. Although these pages won’t get optimized for voice search as an activity in Google Assistant. It’s no surprise that YouTube results feature prominently in Google’s Search results. Focus on video carousel. YouTube results appear frequently in Google’s Search results so targeting videos can be a good option. Until last year, videos were displayed as a thumbnail next to the blue text link. Now Google has started organizing them into a carousel that might be shown above all other results. Make your videos having appropriate content, with quality titles, descriptions, and tags so that search engines and searchers can understand. Apply Video Object schema markup. Product carousel is now 5 years old feature and there is little knowledge about it has to do with schema mark up. Optimizing product carousel would be a good strategy. Check Google’s markup needs for all Carousels. Mark up your product pages in order to notify users about price, availability, and review ratings on Search results. If your markup and optimizations are proper, business panels can have good functionality and interactivity. This will help searchers finding your address, contact number, hours of operation without opening your site, but also be able to book a table, place an order, or make an appointment. Your business panel expands with the addition of more relevant information. Expand your business panel extensively by making your GMB profile rich with descriptive and relevant information. This will help searchers to find you easily. Keep checking your GMB profile and respond to searchers who ask questions, and leave reviews. Google search engine ranking page 1 is quite essential for getting organic traffic and to generate leads. But, this ranking doesn’t come with mere effort and tactics. 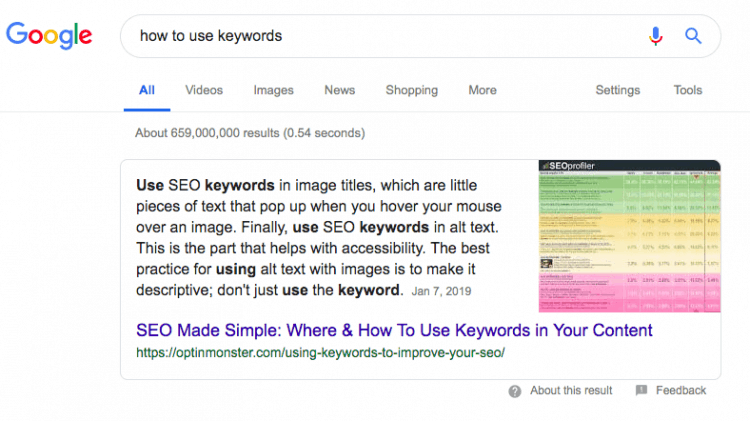 Here is a list of 6 tactics to bring your keywords and website on the first page of Google search result.